This classroom example has been updated from the original. Revisions include alignment to the Canadian Language Benchmarks 2012. A new unit plan template captures the original classroom activities and emphasizes the real world tasks that are the focus for the classroom planning and assessment. A writing task has been added. An adjustment has been made to the assessment tool. This classroom example came from a community-based ESL program for Cantonese and Mandarin speakers. The purpose of the program was to help learners develop English skills and improve their confidence to participate in the community. Many of the learners who came to the program were seniors, and most had had little experience or success in more formal ESL programs. The program was able to keep the class size small (generally about 10 to 12 learners) and maintain an informal learning atmosphere. Classes met twice a week for a total of five hours per week. When learners registered for the program, they were asked in their first language about their purposes for learning English and their preferences regarding topics of study. Once the class began, learners were presented with commonly-identified topics, and were asked to prioritize them. Two or three topic areas were chosen for each of the twelve-week sessions. One of the topics this group of learners selected was shopping. They wanted to be more effective in handling everyday transactions in department stores so that they were not so dependent on family members. They wanted to be able to ask questions, get information, make complaints, and return unsatisfactory merchandise. In response, Cathy developed the unit Shopping for Clothes, with a focus on listening and speaking. The unit goals were anchored in the real world and directly linked to needs identified by the students: for listening, following a sales clerk’s instructions and directions, for speaking, returning an item of clothing, and for reading, reading a complaint to identify the problems the customer has encountered. Cathy ensured that these goals were interrelated so that the activities reinforced the new vocabulary for the unit. Real-world task goals in each skill area, as described above. Context/background information that is important for successful task completion. Competency areas and competency statements for each task. Assessment tasks, which are as close to the “real world” as possible within the confines of the classroom. Cathy then developed a series of activities (see the table below for some examples) that were used with both the CLB 2 and CLB 3 learners over a four week period. She also built in time for review due to the part-time nature of the class. The learning activities were designed to build appropriate task-specific language skills and develop confidence. Cathy was also careful to incorporate activities that reviewed skills addressed in previous units of instruction. Cathy incorporated informal assessment for learning into several of the classroom tasks and used the role-play task as an opportunity to provide both assessment for and of learning. 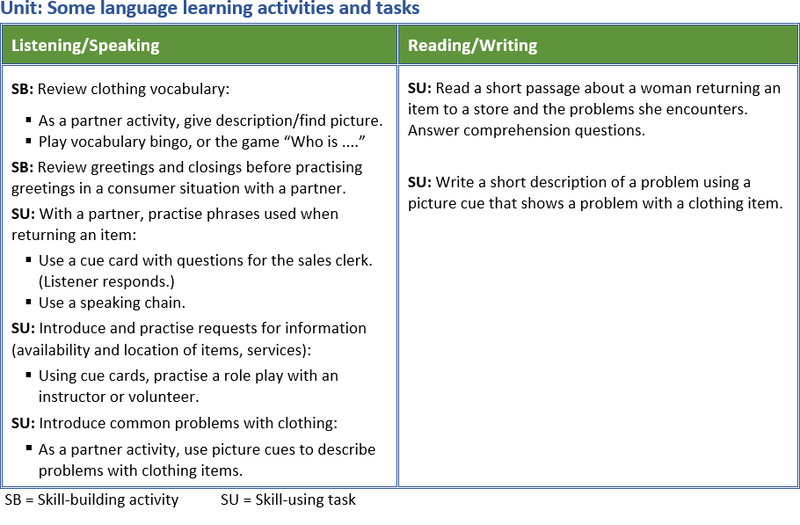 The unit plan addressed all four skill areas; however, this section will focus on the speaking assessment tasks, as an example of the classroom work in this unit. In this section, we first present examples of informal ongoing assessment, before describing the assessment task itself. Keeping track of informal feedback comments can be as simple as using a class list with key items specific to the activity or unit which can be checked during or at the end of a class. For example, for several of the partner activities, Cathy circulated and observed while learners were working in pairs practising the speaking activities. In some cases, she made on-the-spot comments or suggestions. This provided immediate feedback to learners about specific aspects of communication. For other partner activities, she created a simple observation checklist like the one below, which she filled out either while learners were practising, or immediately after the class, to check the skills she had observed learners using and to make brief notes about areas that needed further practice (e.g., intonation of WH questions, specific vocabulary). She used this information to adjust her teaching and decide what items needed further review. Giving ongoing feedback to learners helped them to be more confident and prepared for the role-play assessment task. 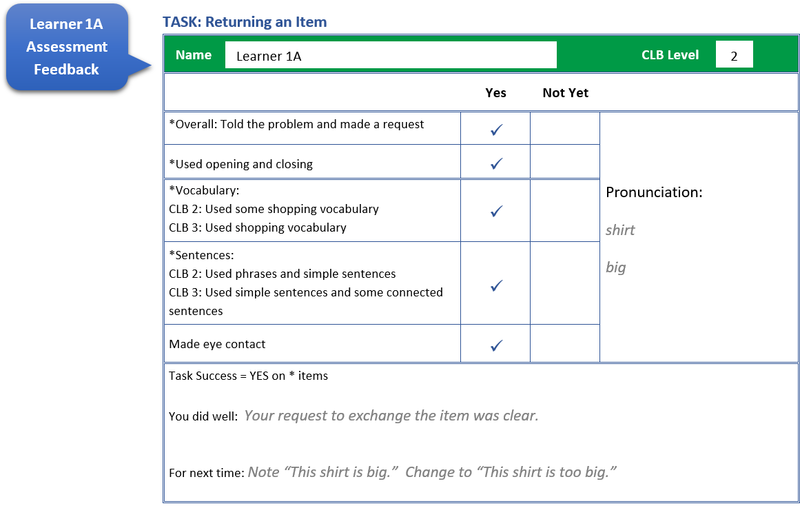 The speaking assessment task is a role play of returning an item of clothing to a store. In the role play, learners were each given a shopping bag that contained a faulty item of clothing. Cathy used a range of items so that learners did not get the same item. The role plays were video recorded. To prepare the assessment task, Cathy selected the assessment criteria based on the task itself, by asking two questions: “What skills are important to accomplish this task?” and “What skills do this group of learners need to focus on?” She chose one overall (holistic) criterion that related to getting one’s meaning across and three more specific (analytic) criteria. She decided to differentiate the task by making the task for CLB 3 students a bit more challenging. The person who role-played the store clerk adjusted the task for the learners who were more proficient by posing some unexpected questions, or asking them to give more explanation of the problem. For the assessment tool, Cathy chose a checklist. She selected criteria that were essential to the successful completion of the task and important to her learners. For each criterion, she gave learners a rating of YES (which means satisfactory for this level), or NOT YET (which means learners are not able to do this – at this time). To be successful on this task, learners needed YES all criteria marked with an asterisk. In the pronunciation section, she noted any words that the learner had difficulty pronouncing. This provided an on-the-spot pronunciation exercise when she met with the learner to give feedback. In the comments section, she wrote comments about specific skills and corrections needed. She also used this section for notes about grammar or vocabulary items that were problematic. Before they began the role plays, Cathy wrote the assessment criteria on the board and the class discussed them. Assessment criteria and criteria for task success can be identified and shared in many ways; the key is to make them comprehensible to the learner. Cathy structured her assessment process to help develop learner confidence. She anticipated that learners would be successful in the role-play tasks and wanted to provide more than one opportunity for them to receive positive feedback related to the assessment criteria. She was interested in encouraging students to become more active in self-assessment. The learners in this class tended to be very critical of their own performance, so she worked towards developing self-assessment through introducing a peer assessment process in addition to her feedback. Cathy set up a situation in which all learners would get positive feedback. After the role plays were complete, she replayed them for the class, stopping after each one. In a larger class, the video recordings might be viewed in groups so that learners only view their own role plays and those of three or four other classmates. Because this was a small class, Cathy was able to review the videos later using the assessment tool she had introduced to the learners. Assessing learners while watching the role plays is possible, but many instructors choose to assess them later in order to concentrate on the role-play process. Cathy’s action-oriented feedback focused on the assessment criteria identified on the assessment tool. Examples of the feedback Cathy provided are shown below for two of the learners (identified as Learner 1A and Learner 1B). The role plays for these two learner samples is below. The following sections provide the learner descriptions, transcripts, and Cathy’s feedback for Learners 1A and 1B. Learner 1A is working at CLB 2. Lin, the facilitator who played the role of clerk, keeps the role play simple and straightforward. The learner has not memorized any dialogue, but expressions appropriate for returning an item to a store have been practised in class. The learner isn’t expected to respond to any unexpected questions or situations, as is appropriate for a learner at CLB 2. Clerk Hi, May I help you? Learner 1A Yes, I like to return this shirt. Clerk Oh, what’s the problem? Learner 1A This shirt is big. Clerk Oh, Ok, it’s too big, eh? Clerk OK. What would you like to do? Would you like to take a refund or an exchange? Learner 1A I’d like to exchange it please. Clerk OK, no problem, but you must have a receipt. Learner 1A (Hands her the receipt) This is receipt. Clerk OK. Good, go get another one and come back to me. Learner 1A OK (goes to get another item and returns) Change this. Clerk OK You want to exchange this? Clerk OK Right, it’s the same value. OK. You can take this. Learner 1A Thank you very much. Clerk An this is your receipt. Learner 1B is working at CLB 3. The facilitator adds an unexpected element to the role play, to make it more challenging, asking the learner if she has worn the shirt. The learner is able to respond appropriately. Learner 1B uses some reduced structures such as “Here, big hole” but also uses some complete sentences with correct past tense forms: “I bought this one two days ago,” and later, “I paid cash.” This phrasing is more typical of speech at CLB 3. Clerk Hi. May I help you? Learner 1B Yes, please. I bought this one two days ago. Learner 1B I would like to return. Clerk Oh, what’s the problem. Learner 1B Because the shirt is torn here. Clerk Oh, let me see. Learner 1B Here, big hole. Clerk OK. Did you wear it? Learner 1B No, I didn’t. Clerk And, what would you like to do? Would you like to take a refund or an exchange? Learner 1B I would like a refund. Clerk A refund. No problem, bud do you have a receipt? Learner 1B Yes, here you are. Clerk How did you pay for it? Learner 1B I paid cash. Clerk Oh, you paid cash (looking at receipt). Ye, indeed, you paid cash. OK, no problem. And here’s your refund and here’s your small change. Later in the course, Cathy looked for ways to build on the skills practised in the assessment tasks. The learners had indicated an interest in getting a library card to have access to books in their first language, so Cathy planned a unit around getting a library card. During this unit, the learners visited a library and had a chance to practise the skills they used in the shopping role play (making requests, responding to small talk, asking for clarification) in an authentic situation. Cathy again planned to combine teacher observation with learner self-assessment in this real life situation. At the end of the unit, Cathy encouraged students to try out their new skills in shopping situations outside the classroom. Some weeks later, one learner came back to class to report a successful experience returning merchandise to a department store. In this classroom scenario, Cathy incorporated CLB-related assessment into the natural flow of the teaching and learning cycle. She built her teaching unit around learning objectives and tasks that had been identified as important by the students in her class. She used the CLB as a guide to planning and at the same time remained learner-centred. Cathy used the assessment task not only as assessment of learning but also as assessment for learning. She focused on what the learner could do well in the role play as well as commenting on an area to improve. Video recording the role plays served a number of purposes. It provided a first opportunity for most learners to see themselves interacting in English. A few learners were somewhat nervous about being recorded, so Cathy allowed for a few ‘false starts’ to give them a chance to relax and do their best. One learner chose not record her role play; she completed it with the facilitator and received individual feedback. After the session, the learners were very enthusiastic, with one initially hesitant learner even suggesting that the class should be video recorded at the end of every semester. The learners were generally successful in their role plays and viewing the recording helped boost their confidence. Having a record of the interactions also allowed the instructor and learners to view the role plays together to discuss both verbal and non-verbal aspects of the interaction. The recordings would make excellent additions to a language learning portfolio. We’ve found that using the CLB as a framework has been very helpful in a number of ways. It’s helped us set realistic expectations for learners’ language development. Using the CLB helps keep us focused on what the learner can DO in English rather than just learning ABOUT the English language (e.g. grammar). We use the CLB as a planning tool. We use a thematic approach based on interests that learners have identified and we relate our language tasks to competencies in the CLB. 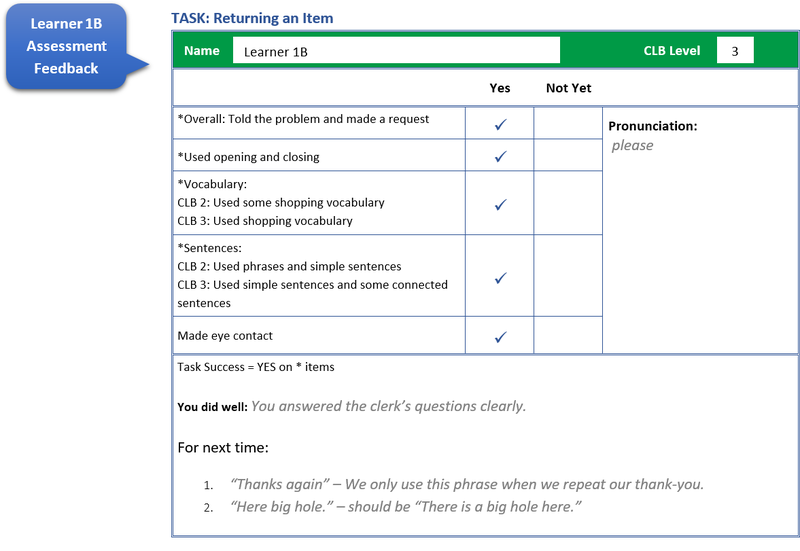 [The CLB] helps us modify task expectations for learners who are at different benchmark levels. For example, in the shopping theme, learners at CLB 2 and 3 role-played returning an item. The CLB helped articulate the difference in criteria for the two levels. 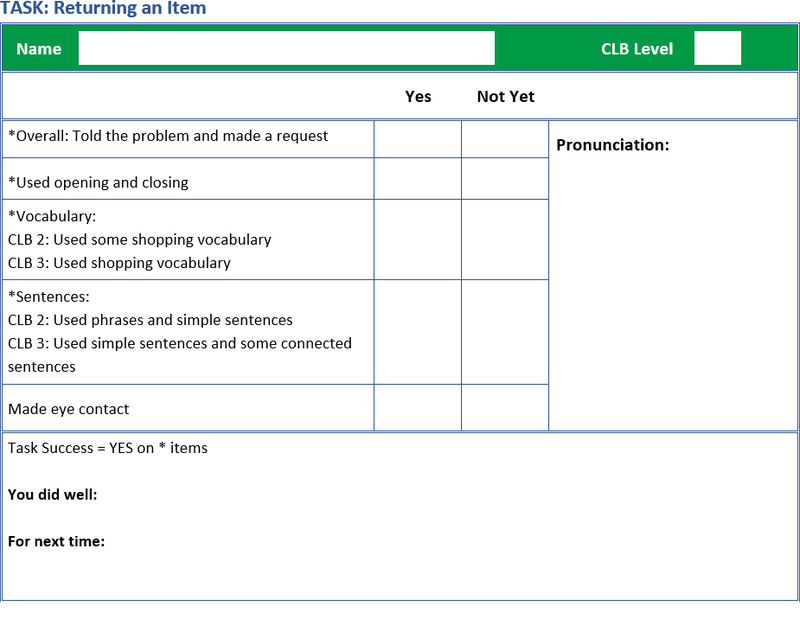 Using the CLB helps us to give feedback to learners based on a set of consistent criteria. Because our program is only five hours a week and most of our learners are seniors, we don’t expect learners will progress to the next benchmark level in the few months they’re with us. We do, however, expect that their language skills will develop within the benchmark level. We try to show learners on a regular basis what new things they can do in English. In addition, we have tasks at the end of each unit and give learners feedback on how they’re doing related to specific criteria we develop for that task. One of our challenges is that learners sometimes identify things they want to do in English that are beyond the expectations for the CLB. For example, some of the learners who were working at CLB 1 and 2 wanted to learn how to use the telephone, but that isn’t identified as a competency until higher benchmark levels. We decided to teach some basic telephone skills such as making an emergency call, and answering the phone and taking a simple message. We didn’t assess these skills as they’re beyond the expectations for CLB 1 and 2, but we wanted to teach these telephone skills as they were important for learners.